The Women’s Association of Morristown Medical Center has once again done a superb job on the 2012 Mansion in May. 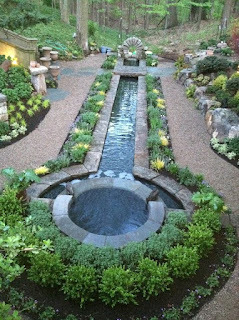 My favorites, of course, are the gardens and the landscape designers, have put together some clever and inspirational ideas for visitors to enjoy. While few of us have the space or the purse to reproduce their grand concepts in toto, these visual delights can be used as jumping-off points for even the most humble of gardens. I tend to favor the moody spaces, such as Back to Nature’s A Living World Awaits and Cording Landscape Design’s Garden in the Glyn, where, in my imagination, I can slip right into the scene before me. But, there’s a garden for everyone here, from the very formal Tudor Rose Garden to the very casual Sports Court. I missed the press event for this year’s Mansion in May, but am hoping to see it later this month. A designer showhouse and gardens presented by the Women’s Association of Morristown Medical Center, the setting is a spectacular castle near Morristown’s fabulous “Millionaire’s Row.” Sixty landscape and interior designers have done a superb job and the $30 ticket price goes to support a good cause --- the new Inpatient Hospice and Palliative Care Center. The mansion and grounds, Glynallyn, are open now through May 31st. Set on seven acres of terraced gardens the estate, named Glynallyn, is a 32,000 square foot manor home modeled after the English castle Compton Wynyates in Warwickshire England, a favorite of the British royal family. Glynallyn is listed on the National Register of Historical Places and is considered one of the most impressive examples of English Tudor architecture in the United States.